How do we become truly fluid with a specific task or series of tasks? How can the handler practice a clear, consistent signal or group of signals? How can we engage the horse to willingly carrying out tasks confidently at our request? Moving easily between ‘no intent’ and ‘intent’ body language. Timing of the click to truly mark the desired behavior. The temptation is to get the horse to ‘do it again’ so we can practice. However, if a horse had carried out a complex task to a good standard, does it make sense to him to have to do it again right away? Probably not. He may instead think that he didn’t get it right the first time. He may try a different variation in good faith and become confused if it does not result in a click&treat. We acquire a complex task by teaching it via thin-slicing. The ACQUISITION STAGE is finished when our signals are relatively consistent, and the horse’s response is accurate about 90% of the time. Then we enter the STAGE OF BUILDING FLUIDITY with the task. Gaining fluidity, with either new thought processes or new movements, means building up nerve connections. The only way to build up nerve connections is to apply our full attention to repeating the learning process. Once we have a general idea about what we are learning, we focus our attention on the detail by reviewing the new skills often enough to put them into our long-term mental and muscle memory. This involves repetition. How we do the repetition can vary. Drilling involves repeating something over and over. Good point: it will become habitual. Bad point: it can kill enthusiasm for both that task and learning anything else by drilling. For example, horses who are routinely made to move endless circles in a round pen, or constantly repeat dressage movements, often form an aversion to going into a round pen or arena. To put a behavior into the horse’s long- term memory and have it ‘on signal’ or ‘on cue’ seems to be best done with 1-3 repeats each session over the number of days, weeks, or months that it might take, depending on the complexity of the final objective. If the horse does a behavior to a pleasing standard the first time we ask, it is often a good idea to wait until the next session or later in the same session before asking for it again. there is evidence (human studies) to suggest that if we focus on clearly visualizing the muscular movements needed to achieve an outcome, the brain views this as almost as good as actually doing it. We can’t know whether horses visualize things, but my experience with teaching horses in mini-sessions or 1-3 repeats suggests that they do seem to ‘mull over’ new learning and bring a brighter response to the next time we do it. This is especially noticeable if we can have a short repeat most days. Once the horse shows a good knowledge of a task, a break of 2-3 days between requests often brings even more keenness to have ‘another go’ to earn a special high-value treat. My horse, Boots, has a distinct little smug expression when she nails something especially well, earning approbation, applause, and a triple treat, a jackpot or a very special treat like a peppermint. To improve our expertise with the task, we can ask another person to stand in for our horse so we can practice developing clear signals and build up our mental and muscle memory for our part of the equation. The horse can only be as smooth in his responses as we are smooth and clear (fluid) with our signals. If we are lucky enough to have an older, more experienced horse available, we can practice with him so we can be more coherent for a young or new horse. To have a way of steadily improving the fluidity of challenging tasks, I decide on what mini-objectives I want to play with today, before we begin a session. I pocket the exact number of higher-value treats to cover those objectives; usually one peppermint for a spot-on effort. In addition, I have un-shelled peanuts or carrot strips for good attempts. This stops me from being tempted to ‘do it again’ once we have a peppermint-worthy response. I also carry (horse pellets) for getting organized with resets and for when we do more relaxing things between the mini-objective items for the day. In a way, it’s an example of getting more by doing less. The video clip below shows three examples. They are either fun tricks to keep us amused, moving and supple, or they are Horse Agility tasks that are getting rather tricky because we have reached the higher-level ‘walk only’ class. Instead of increasing task difficulty with trot or canter, the tasks get more convoluted. I’ve chosen relatively complex tasks. To reach the point shown in the video, the prerequisites for each task were taught with thin-slicing over a long time. One peppermint for a 180-degree turn and back through a gate. Previously she learned a 360-degree turn by following the feel of a rope, then learned hand and voice signals and willingly did it at liberty during a recall. Some people teach this using a target. Boots also has had many practices backing up when I stand behind her, including months of long-reining training. A jackpot of five rapid treats for backing 8 steps in a straight line to end up in a 2.5-foot space between a barrel and me on a mounting block or between two barrels. In a session I did this once in each direction, so she could earn two peppermints. She knows ‘park and wait’ thoroughly as well as backing up with me behind her. She also has a strong background in backing out of narrow dead-end lanes as part of trailer loading preparation, which is how we started training this task. I simply added the barrel on one side and me on a mounting block on the other side. An un-shelled peanut for our line-dancing move while I’m on the right side of the horse and another while I’m on her left side. We’ve been doing this for only a few months. She understood yielding the shoulder to touch or gesture as well as targeting her shoulder to my hand before we started. She had also learned to target her knee to my hand, so I had to be careful about developing a distinctly different hand signal. For a long time, I asked for only one repeat before the click&treat. We are now gradually building in more repeats before the click&treat. #163 HorseGym with Boots: Gaining Fluidity without Drilling. If our first attempt at a task is a bit sketchy, we do a quiet reset and try again, looking for improvement, click&treat for the improvement and usually we don’t repeat it again until later in the session or next day. Instead, we go on to one of the other things we are working on, or just do activities that are well-established. It seems that after a few weeks of repeating a complex task once daily, the horse often begins to look forward to doing it, knowing that a higher-value treat follows. Cherishing each mini-objective set for the day’s session and rewarding it with a higher-value treat keeps alive the fresh desire to do it again tomorrow. If you are really keen, you can watch the whole filmed video series from which I took example two in the clip above, showing Boots backing up to eight steps to end up between a barrel and me on a mounting block. This is what we did for the first 30 days. During days 31-38 we practiced Boots backing up to stand between two barrels when I stood in front, facing her. I filmed each of the first 30 training sessions. Over 38 days we trained an average of 5 minute on this task per day, so the total training time was 3 hours, 10 minutes. She already knew about backing up when I stood behind her, so we were adding more detail to the task. She had to learn to stay straight and to target her withers to my hand. The clips clearly show how we were both learning stuff each day. I was learning how to be clearer in my teaching and she was figuring out exactly what she had to do to earn the click&treat. Before and after each short session we did other things. This is the first clip in the series. They all follow in a playlist called Backing Up to a Mounting Block. Each clip is quite short. This entry was posted in Clicker Training Skills, skills, Training Plans and tagged Chaining behaviors, Clicker Training, equine body language, Fluidity, Positive Reinforcememnt training, thin-slicing, Training Horses on March 3, 2019 by herthajames. In the photo above Boots is leaning her weight toward me to connect with my hand which I held a small distance away from her shoulder. Teaching the horse a signal to target his shoulder to our hand fits in nicely after we have taught him a signal to yield his shoulder away from us. Horse and handler are clicker savvy. 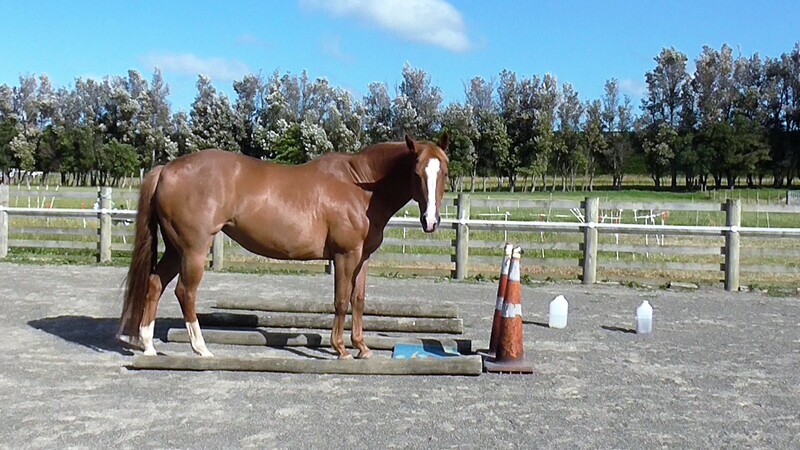 Horse is comfortable standing ‘parked’ with the handler standing alongside. To review, check out my ‘Using Mats’ blog. Handler has developed his/her ‘zero intent’ and ‘intent’ body language. To review, see the clip #153 HorseGym with Boots: Zero Intent and Intent toward the end of this blog or check out the ‘Zero Intent’ and ‘Intent’ blog. A work area where the horse is relaxed and confident. Ideally, the horse can see his buddies, but they can’t interfere. The horse is not hungry. Halter and lead (kept loose) and a safe, enclosed area for working at liberty, if possible. For generalization, a hoop, ground rail, mounting block or similar. Horse confidently moves his left or right shoulder toward the handler’s ‘outstretched hand’ gesture signal. When we request the shoulder to yield away, we project energy at the horse’s shoulder from our body’s core at the belly-button which causes our posture to be upright. When we request the shoulder to move toward us, it is important to pull our belly-button back so that we create a ‘draw toward me’ energy with our whole body. Horses are so sensitive to advancing and receding energy from another body, that they easily read the intent of our posture as long as we are totally consistent and not sloppy. Stay with each slice until it feels ho-hum and smooth for both of you. Make each session extremely short, 2-3 minutes. The magic is not in the final result as much as it is in the process of helping the horse figure it out. Ask the horse to park squarely; click&treat. Take up a position shoulder-to-shoulder with the horse and relax; click&treat. Work up to standing together quietly for five seconds before the click&treat, on each side of the horse. Reach out the flat back of your hand to lightly touch the horse’s shoulder; click&treat the moment your hand makes contact. Take up the ‘no intent’ or ‘zero intent’ body position and wait to see if the horse is okay for you to carry on. If he continues to stand in a relaxed manner, he is probably okay to carry on, or you may have sorted out one or more ‘okay to proceed’ signals. Repeat 3 and 4 above, watching for any weight shift the horse makes toward your hand as you move it toward his shoulder. If he does, celebrate hugely with happy words and a jackpot or triple treat. Avoid the urge to see if he will do it again. Wait until your next session. When you feel the time is right, hold your hand a tiny distance away from touching the shoulder and WAIT for the horse to shift his weight to make the contact; click&treat. Some horses may step toward you to make the contact right away. For either one, celebrate hugely once again. Maybe do it once or twice more to consolidate the idea. It took Boots a couple of weeks of daily mini-sessions before she consistently leaned toward my hand to make the contact. Then it took more days before she confidently stepped toward my hand when I held it further away. Decide whether you want to continue teaching on the side you started with, or if you want to teach slices 1-6 on the other side of the horse before proceeding. When 6 is ho-hum, gradually hold your hand a little bit further away so the horse must take a sideways step to contact your hand; click&treat. Whenever the response seems slow or unsure (or is missing), go back to touch the shoulder; click&treat. Then work forward again at a rate that keeps the horse being continually successful as much as possible. When starting a new session, always introduce the task with a shoulder touch; click&treat, to let the horse know which game you are playing. Work to having the response equally smooth on either side of the horse. If the horse is mat-savvy, lay a mat beside the horse to act as a destination. Place the mat so the horse takes one step over to reach it. Gradually increase the distance to get two steps, then three steps. Turn on the haunches: ask the horse to step around to complete one/quarter of a circle (90 degrees). When that is smooth, work toward 180 degrees, and finally a full turn on the haunches (360 degrees). It can take a while to build confidence to do more than a quarter or half circle keeping the hind feet relatively in one place. Repeat 1 above on the other side of the horse. Because our bodies and the horse’s body are asymmetrical, one side is usually easier. It helps to do a bit more on the harder side until, after lots of short sessions, both sides feel smooth. Add a hoop (made so it comes apart if it catches on the horse’s leg) to the turn on the haunches exercise. This increases the level of difficulty, so start at the beginning with just one step and work up very gradually. Be careful not to make the horse feel wrong if he steps out of the hoop with a hind foot. If he does step out, quietly walk away together and return for a reset. The video clip demonstrates where I got too greedy, wanting too much, and it blew Boots’ confidence for a while. Keep each session super short and celebrate each new success hugely. This exercise enhances foot awareness. Stand the horse with his hind end nearer the mounting block than his shoulder, step on the block and ask him to bring his shoulder over so he is in the mounting position. 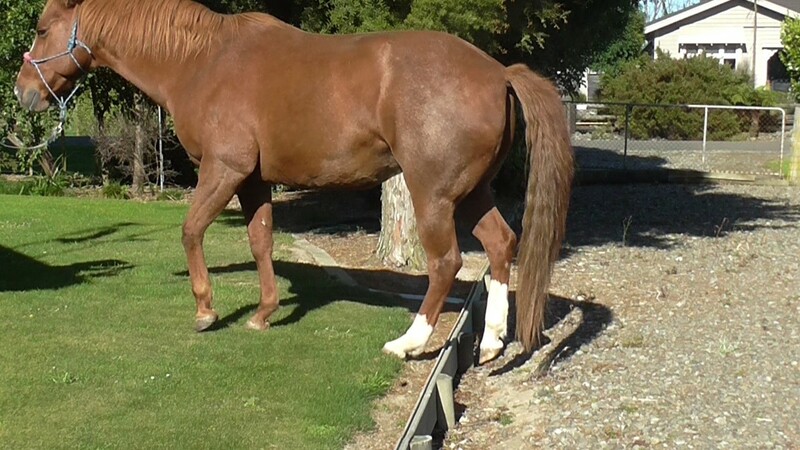 If you want to focus on the horse moving toward you in a straight line, rather than in a circular pattern as above, stand the horse over a rail and see if he will bring his hind end along. If not, leave moving straight for now until you teach the ‘ribs toward me’ lessons. When shoulder to hand is smooth, start again at the beginning with ‘ribs to hand’. Follow the exact same procedure but start with a touch to the center of the ribs instead of the shoulder. This entry was posted in Clicker Training Skills, skills, Thin Slicing a Task, Training Plans, Uncategorized and tagged body language, Clicker Training, Consent Signals, gesture signals, Horse Training, mat targets, Okay Signals, parking, stationing, thin-slicing, Training Horses, zero intent on March 1, 2019 by herthajames. Chaining behaviors refers to linking together individual tasks into a flow of activity. The photo above shows how we chained repetitions of the task, “Go touch the cone” in order to build confidence walking down the road away from home. Once the horse understands this game, the cones can be put further apart, less in number and eventually phased out and replaced with items naturally found along the route to use as click&treat spots. We might aim for one click&treat at the end of a series of behaviors. Alternatively, we might click for each specific behavior in the chain, or for two or three behaviors within the chain that easily link into each other. We can also back-chain, where we begin with the last behavior in the series, and gradually link in each previous behavior. If we specifically want the horse to do a series of behaviors with only one click&treat at the end, this method can work well. People who have spent more time studying ‘chaining’ in detail prefer to start with a concept called ‘sequencing’. They then describe different kinds of sequences. Tandem Units – when each part of the sequence is exactly the same. Examples are the ‘cone-to -cone’ exercise in the photo above and the 20 Steps Exercise outlined below. Conjunctive Units – when there is a sequence to be done, but they could be done in any order. For example, if we have a selection of obstacles set out to do gymnastic exercises with our horse, we can do them in any order. Chained Units – step one of the sequence must occur before step, 2, step 2 before step 3, and so on. For example, saddling or harnessing a horse. Another example might be walking into the pasture, haltering the horse, walking back to the gate with the horse, opening the gate, asking the horse to walk through the gate, closing the gate, which is outlined in one of the clips below. When we train by splitting a goal behavior into its smallest teachable units (slices), we link the slices together as the horse becomes competent with each bit of new learning. In most cases, the sequence is important, so each slice is part of a chained unit. The example below about Head Rocking illustrates. Something like a dressage test, horse agility course, jumping course or western equitation course is made up of discrete units or behavior (conjunctive) but the competition requires them to be done in a strict order, so they become ‘chained’. We can train each unit in a ‘conjunctive’ context, then present them in the required chain for the competition. This clip is the same as the one above but done with halter and lead and a handler new to the exercise. #30 HorseGym with Boots: Leading Position Three Duration Exercise. Increasing duration of a behavior is basically increasing the number of ‘tandem units’ before we click&treat. The units might be steps, as in this exercise, or they might be increasing time staying parked or they might be the number of times your horse paws if you are teaching him to count. This clip is an introduction to head rocking. The slices are quite tiny and are steadily chained together to accomplish the final task. Since the order or units matters, it is a true chained sequence. 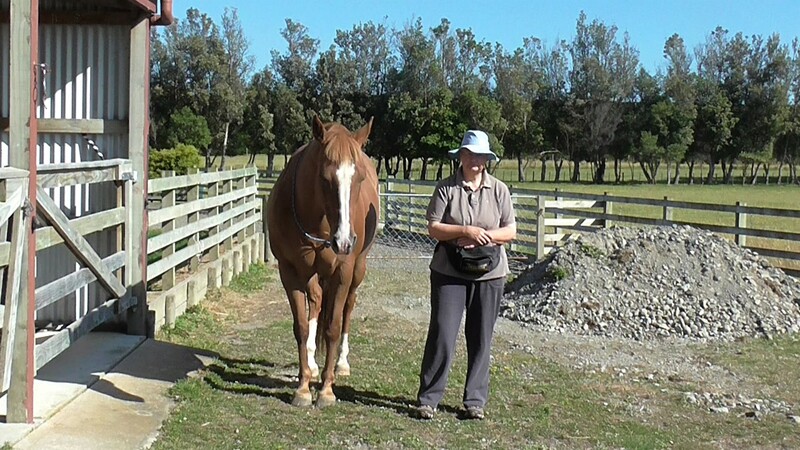 This clip looks at how we chain a series of tasks when we do something like bringing our horse in from a paddock. Usually I would do the whole process with one click&treat after putting on the halter, and another when I take off the halter. The horse has previously (separately) learned each of the tasks that make up this chain of events. The clip below looks at using a mat to help chain a series of tasks. #12 HorseGym with Boots: CHAINING TASKS. This could be seen as an ‘artificial’ chain because we have decided on the order of the tasks. They could be done in any order so turning it into a conjunctive chain. The clip below shows a series of more difficult tasks. Each task is individually taught to a high standard. Then I forward chain or back-chain them together according to the requirement of that month’s competition.The order of the tasks has been arbitrarily set for the competition, so this too is an ‘artificial’ chain made up of a series of unrelated tasks. Back-chaining simply means that we begin with the final behavior in a series and work backward toward the eventual starting point. Halter and lead to introduce the idea to the horse. Safe, enclosed area for working at liberty. Objects to create the circle outline, as in the video clip or set up a raised barrier. The horse moves willingly on the outside of a circle of objects, firs to mat destination, later listening for a ‘whoa’ signal. If we want to teach a horse to move in a circle around the outside of a round pen, we can use a mat as the horse’s destination and back-chain a whole circle at walk and a whole circle at trot (energetic horses may offer a canter). The set-up requires a round pen of ground or raised rails or tape on uprights or a collection of items to outline the circle. The horse walks around the outside of the barrier and the handler walks on the inside of the barrier. Note: Keep the sessions very short – just a few minutes. We never want to turn anything into a drill. Five minutes a day over a few weeks will give a lot of results. Stay with each slice until both you and the horse are totally comfortable with it. Lead the horse around the circle and have him target the mat with his feet; click&treat. Repeat until the horse has a strong association with the mat due to always receiving a click&treat there. With a looped rope (or unclip the rope if you are in a safe, enclosed area) ask the horse to ‘walk on’ to the mat; click&treat. Snap on the lead rope, walk around the circle and repeat 2 at the same distance until the horse keenly heads to the mat. Walk along with the horse, at the horse’s pace, inside the barrier. Gradually halt further from the mat before asking the horse to go target the mat. If he loses confidence, return to a smaller distance. Better to increase the distance by very small increments rather than ask for too much too soon. Click&treat each arrival at the mat. If the horse offers a trot at any time (or a canter) and stays on the circle, celebrate hugely. Such willingness is precious. When the horse willingly offers a whole circle, celebrate large with happy words and a jackpot or triple treat. When it is good in one direction, teach it again, from the beginning, walking in the other direction. Make the task more interesting by putting the mat in different places on the circle. Once you have whole circles, and you are in a safe area where you can work without the lead, leave it off. This allows you to gradually walk a much smaller circle as the horse stays on his big circle on the outside of the barrier. Click&treat each time the horse reaches the mat. He will soon realize that even if you are a distance away from him when you click, you will quickly walk to him to deliver the treat. Some horses get anxious when they can’t stay right next to the handler. Play with 9 until you can just rotate in the center of the circle as the horse walks around. If you’d like to work with trot, and the horse has not already offered it, start again with slice 2 and use your body energy to suggest a trot. If your horse knows a voice ‘trot’ signal, use that too. Celebrate if he trots to the mat. If you like, gradually make your circle larger. This is back-chaining because you have shown the horse the final result which will earn the click&treat (targeting the mat) and then added in the previous requirements, which in this case were increasing distances from the mat. In the final behavior, the mat is both the starting point and the end point. If you are wondering about how we can get multiple circles this way, we can eventually use our ‘halt’ signal to replace the mat and ask the horse to do more than one circle (in gradual increments) before asking him to halt for his click&treat. Consolidate the final task: Trot through the plastic bottles and halt on the tarp for a click&treat. Back up seven steps, halt, then trot over the plastic bottles and halt on the tarp for a treat. Trot through the curtain, back up seven steps, halt, then trot over the plastic bottles and halt on the tarp for a treat. Trot through the z-bend, trot through the curtain, back up seven steps, halt, then trot over the plastic bottles and halt on the tarp for a treat. Through the pool noodles, trot through the z-bend, trot through the curtain, back up seven steps, halt, then trot over the plastic bottles and halt on the tarp for a treat. Trot through scary corridor of flags, through the pool noodles, trot through the z-bend, trot through the curtain, back up seven steps, halt, then trot over the plastic bottles and halt on the tarp for a treat. Drag the bottles, trot through scary corridor of flags, through the pool noodles, trot through the z-bend, trot through the curtain, back up seven steps, halt, then trot over the plastic bottles and halt on the tarp for a treat. Weave five markers, drag the bottles, trot through scary corridor of flags, through the pool noodles, trot through the z-bend, trot through the curtain, back up seven steps, halt, then trot over the plastic bottles and halt on the tarp for a treat. From halt, trot off the tarp, weave five markers, drag the bottles, trot through scary corridor of flags, through the pool noodles, trot through the z-bend, trot through the curtain, back up seven steps, halt, then trot over the plastic bottles and halt on the tarp for a treat. Walk onto the tarp and halt, trot off the tarp, weave five markers, drag the bottles, trot through scary corridor of flags, through the pool noodles, trot through the z-bend, trot through the curtain, back up seven steps, halt, then trot over the plastic bottles and halt on the tarp for a treat. Back-chaining works well when we want/need to consolidate the place and time for the click&treat at the very end of a sequence of events. This entry was posted in Thin Slicing a Task, Training Plans, Uncategorized and tagged Chaining behaviors, chaining slices, chaining tasks, Equine Clicker Training, foot targets, mat targets, Positive Reinforcememnt training, thin-slicing, Training Horses on February 12, 2019 by herthajames. This exercise developed from something my horse offered when I was in the tack room where there is a wooden platform in front of the door. While I was in the tack room getting organized, Boots would step up onto the wooden platform to see what I was doing. I recognized the beneficial gymnastic effect when I asked her to back off the platform and step up again in a rhythmic pattern. It became one of her favorite things to do. Interestingly, she never seems to have enough of it, and I have to be the one to suggest that we should do something else. This Step Aerobics task has become our go-too exercise when time is limited but we want a bit of a warm-up before cleaning her feet or doing other tasks. When it’s too wet or hot or windy for much else, it’s a fun way to build some movement into our time together. Step Aerobics, just like the human version, is an exercise that requires whole-body movement and flexion of all the joints, so it is an ideal task to do often in short bursts. Items with an asterisk (*) are training plans covered in detail in my book, Precision Horse Training with Positive Reinforcement: 12 Thin-Sliced Groundwork Plans, available as e-book or paperback via Amazon. The ‘Finesse Back-Up’ exercise is ideal to teach a reliable back-up while we are facing the horse. The description and two clips below show how we evolved it. Working across a barrier, using a hand-held target for stepping forward, and using body language, breathing, intent and voice signals for backing up. Adding a halter and rope signal to the back-up so we can use it anywhere. Once the horse knows the task, the rope pressure signal usually isn’t needed because the horse responds to the breathing, body language, voice and distinct orientation signals. Once voice, body language, intent and orientation signals are well established, we have a reliable back up at liberty while we are facing the horse. To the signals in 3 above, we add a clear ‘raised fingers’ gesture signal to the back-up while we are facing the horse, allowing us to communicate clearly from further away. The other part of Step Aerobics is a recall signal. Teaching and consolidating a recall signal are outlined in these video clips. My ‘recall’ gesture signal in this context is a movement where I shrink backwards and drop my energy and make a circle with my arms. Halter and lead (as minimal pressure as possible on the lead, but enough to be effective) and a safe, enclosed area for working at liberty. Materials to build a simple lane (one side can be a safe fence) and to block off one end of it. Different mats familiar to the horse. 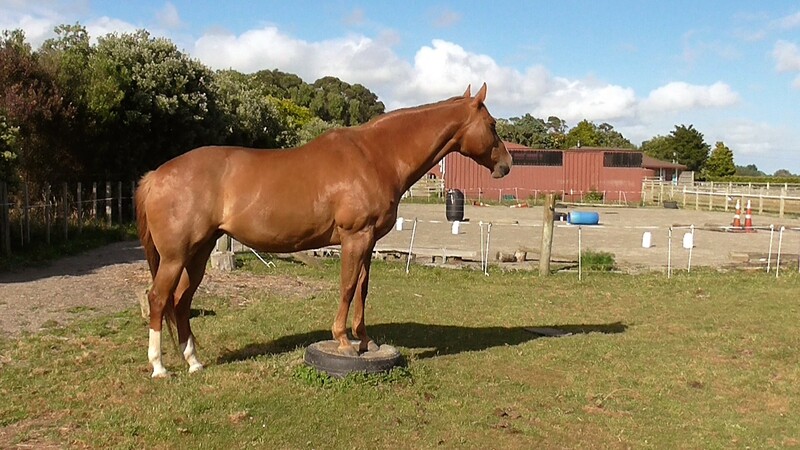 A pedestal or a step-up situation safe for the horse. 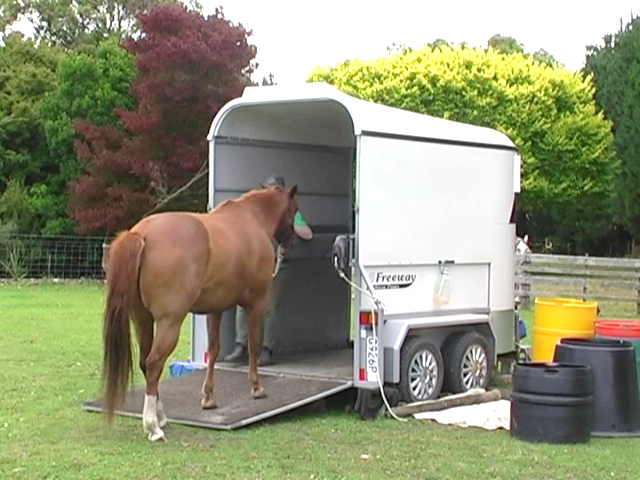 A step-up trailer is an option, or setting up the trailer ramp as a step. Boots has taken herself to stand on a tire-pedestal while I organize the camera. 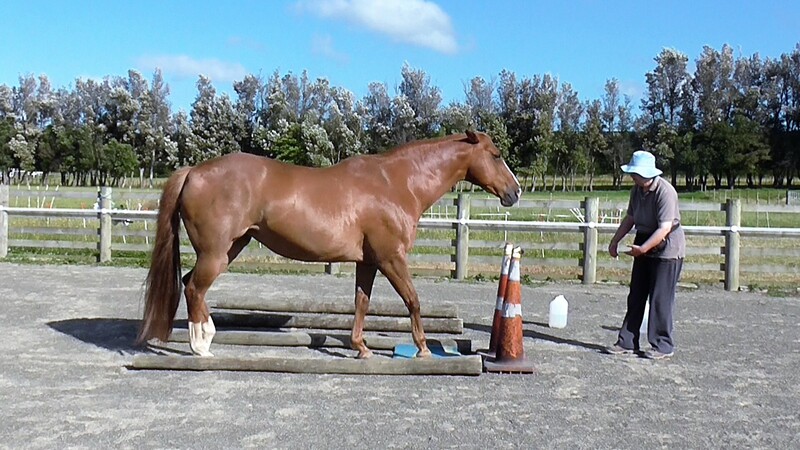 Horse steps up onto a pedestal (or step), then steps backwards down again, in a rhythmic pattern repeated several times. A simple lane made with two rails, blocked off at one end with two tall cones, and a mat in the lane, demonstrating Slice 4 of the training plan. Set up a simple lane. My lane in the video is two ground rails. You may want to begin with a higher-sided lane to make the behavior option we want as clear as possible for the horse. One side can be a safe fence. Ensure that the horse can walk right through the lane confidently; click&treat each time he calmly passes right through the lane. Handler walks on the outside of the lane. Walk a loop with the horse to repeat. Set a target mat near the end of the lane. Walk the horse into the lane and ask him to halt with his feet on the mat; click&treat. Walk him out of the lane forward, making a circuit to repeat targeting the mat. When 3 is done reliably with confidence, block off the lane at the end nearest the mat. Ask the horse to walk into the lane and target the mat; click&treat. Position yourself facing the horse, a bit to one side. Review the ‘Finesse Back-Up procedure as outline in the prerequisites. Click&treat for one or two steps back on request. When you no longer need to run your hand up the rope because the horse responds to your body language, inward breath, intent, and voice signals, begin holding your hands up higher until eventually your gesture signal morphs into your fingers held up beside your ears waggling to suggest backward movement; click&treat and celebrate hugely when he does (triple treat or jackpot or special treat). Keep a non-influencing loop in the rope or lay the rope over the horse’s neck out of the way. We want the raised fingers to become a main ‘back up please’ gesture. But at this point we still emphasize our inward breath, posture expressing intent and voice along with the gesture. Use your recall signal to ask the horse to come forward onto the mat again; click&treat. My recall signal as shown in the clips is a movement where I shrink backwards and drop my energy and make a circle with my arms. I learned it from Sharon Wilsie’s book, HorseSpeak. Alternate the back-up (click&treat) with the recall (click&treat). The aim is to smoothly get a series of these one after the other. Eventually, when 10 is really solid, you can ask for a back-up and a recall before the click&treat. Or ask for a recall followed by a back-up before the click&treat, moving toward the horse to deliver the treat. Once 10 is smooth, practice with a barrier on only one side of the horse. When 12 is smooth, practice with no barriers. When 13 is smooth, practice with a variety of mats and in a variety of different places. When 14 is smooth, introduce a pedestal or step. If the ‘step up’ idea is new to your horse, it can be helpful if you place a familiar mat on the pedestal the first time you ask. For some horses, it may help to begin with a relatively low ‘step up’ situation, such as a plank or thick board before asking for a higher step. At first be careful about asking for too many repeats. For some horses it will be an unaccustomed way of using their joints. Three repeats at one time is plenty to start with. Doing a little bit often is ideal. Once you are doing it at liberty the horse will probably let you know if he’s done enough. We can use the back or sides of a trailer ramps as our ‘step’. I have used a solid piece of timber under the end of the ramp to create a step-up situation. If you’re able to move your pedestal, move it to different locations. I have three ‘tire-pedestals’ set up in different parts of our training areas. A step-up trailer is another option. If you have a trailer with a ramp, and there are no jagged bits on the sides of the ramp, use the sides of the ramp as a ‘step-up’ spot. If you ride or walk with your horse out in the countryside, look for spots that create a natural safe step. I’ve used our concrete front door step in the past. Some people fill different-sized tires giving different heights for a step or build a series of pedestals. If your pedestal is large enough, or you have a spot like the one in the photo below, ask the whole horse to step up and step down again. I’ve asked Boots to step up with all four feet, then step back down again. The wooden lip and uneven ground make it more challenging. I look forward to hearing and seeing how you get on if you take up this challenge. This entry was posted in Clicker Training Skills, skills, Thin Slicing a Task, Training Plans and tagged body language, Clicker Training, equine body language, foot targets, mats, Positive Reinforcement Training, recall, stationing, suppleness, thin-slicing, Training Horses, wait, whoa signals, zero intent on January 31, 2019 by herthajames. What is Equine Clicker Training? Clicker training is also called Positive Reinforcement Training. It is a way of establishing 2-way communication with a horse. When the horse presents a behavior that we want to encourage, we use a special sound followed right away with a small food treat that the horse really likes. Like all of us, horses will seek to re-create a behavior that gives them a positive result. The special sound can be made mechanically with a ‘clicker’ or it can be a ‘tongue click’ or a special sound/word that we never use any other time. Often a mechanical clicker is useful to first teach a new behavior. Then it is easy to change to a tongue click or our chosen sound/word. This makes it easier because working with horses we usually need our hands free to use ropes and body extensions. Since horses are designed to eat much of the time, a food treat is usually appreciated as long as we make sure it is something they really like. It’s important to keep each treat very small and to include the treats in the horse’s daily calorie intake. A good way to learn clicker training skills is to start with the Target Game. Before communication can start, the horse has to understand the connection between the marker sound and the treat that will follow. Some people call this ‘charging the clicker’. It just means that the horse has learned that if he hears that particular sound, a treat will always follow. It’s a good idea to first practice the mechanics of this with another person standing in as the horse. Well-timed food delivery is a key to success with this way of training. It is easier for the horse if the handler had muddled through the learning of the mechanics of treat delivery. At the beginning it can feel a bit like tapping ones head and rubbing ones belly at the same time. Ideally have the horse in view of his friends, but separated from them. He will learn best if he is not hungry or thirsty and if he is in a relaxed frame of mind. I always ensure that the horse has been grazing or had access to hay before I train. We’d like the horse to put his nose on a ‘target’ that we present near his nose. Have a hand ready on the clicker, if using one. Have a safe barrier between you and the horse. Present the target – gently to one side of his nose, not thrust directly at him. A plastic drink bottle or a safe object taped onto a stick is good to start with. And promptly reach into a pocket or pouch to get out a treat. Use a pocket or pouch that allows the hand to smoothly slip in and out. Be careful never to reach into the pocket or pound until after you’ve clicked. This gets important later. Present the treat to the horse in a firm, totally flat hand so it is easy for him to retrieve the treat. For some horses it may work better at first to toss the treat into a nearby familiar food bucket. The skill of taking a treat politely from the hand can be learned later. If he pushes your hand down, gently push upwards with equal pressure. When he’s eaten his treat, present the target again. If we keep each targeting session short (3-4 minutes) and are able to repeat them 2 or 3 times in a day, the horse will learn quickly and look forward to each session. The Target Game is a good one to start with because when you finish you simply put the target away. Using the Target Game will let you decide whether Clicker Training (Training with Positive Reinforcement) is something you’d like to carry on with. It can be done alongside anything else you do with your horse. The little clip below shows the beginnings and how it might develop over time. The horses in the clip are already clicker-savvy. Be aware that at first we should always present the target in the same place. When the horse consistently gets 10/10 for that, we can change to holding it higher up. Then eventually lower down and to the side and requiring the horse to move to reach it. But it’s important to get 10/10 for each of these, before we make a change. There is a little series of clicker training activities posted on YouTube. They can be reached by putting HorseGym with Boots into the YouTube search engine, then clicking on the ‘playlist’ of the same name. Or below is the first of the series. This entry was posted in Clicker Training Skills and tagged Clicker Training, Equine Clicker Training, Hertha James, Horse Agility, Horse Training, Natural Horsemanship, Positive Reinforcement Training, PRT, Training Horses on December 27, 2014 by herthajames. When we want to teach our horse something, the first thing we need is a PLAN. A plan written down has the advantage that we can look back on it. As we get feedback from the horse and our own actions, we can go back and tweak our original plan. Or we can throw it out and start again :-). Brainstorm all the individual specific actions the horse needs to be able to do to complete the whole task. Put the actions from 2. above into an order that seems logical. Each specific action will have one or more ‘click points’ where we click&treat. This allows the horse to pro-actively seek the hot ‘click point’ of the moment and makes training fun for everyone involved. This is the thin-slicing part. Decide how we might teach each specific action (by free-shaping, pressure & release, using a nose or foot target, or even modeling for the horse what we would like him to do). This part of the plan includes thinking about what sort of environmental props would make each part of the task easier for the horse to learn (e.g., rails, markers, barriers, lane-ways, corners). Experiment with the horse and gain feedback to see what is working and what needs rethinking and tweaking [or starting over with a new idea 🙂 ]. Gradually chain the specific actions together until the horse knows the pattern and willingly carries out the whole task with one ‘click point’ at the end. The video clip link below is a bit long (9 min) but it demonstrates all the parts of a PLAN and it uses various teaching methods to get to the final successful outcome. This entry was posted in Thin Slicing a Task and tagged Clicker Training, Equine Clicker Training, Hertha James, Horse Agility, Horse Training, Natural Horsemanship, Positive Reinforcement Training, PRT, Training Horses on August 23, 2014 by herthajames.